Roads – Enter a city name to find roads in China. Weather – Click on the map, then choose a China province. Languages – This page has several in-depth maps of China. – Useful information such as elevation, major transportation routes, and national parks is clearly displayed. Special attention paid to road designation and the extensive labeling of physical features such as mountain ranges, valleys and peaks. Each map comes with an inset of a major city, national park, or area of historical significance. 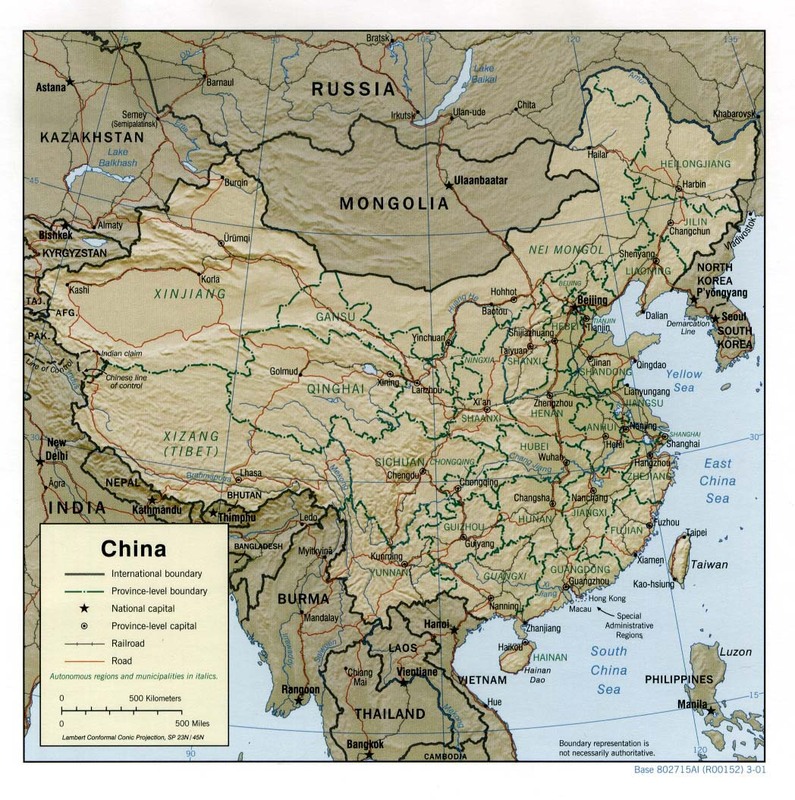 – Large high-quality laminated wall map of China. Exclusively developed by Maps.com and GRAPHI-OGRE and not available in any store, this wall map was created using high resolution vector digital imagery with state-of-the-art print on demand technology. Printed on 24lb. premium coated bond paper and laminated on both sides using 3mm laminate through a hot lamination process, this map is markable using dry erase pens and can be easily cleaned. Available in 3 sizes. 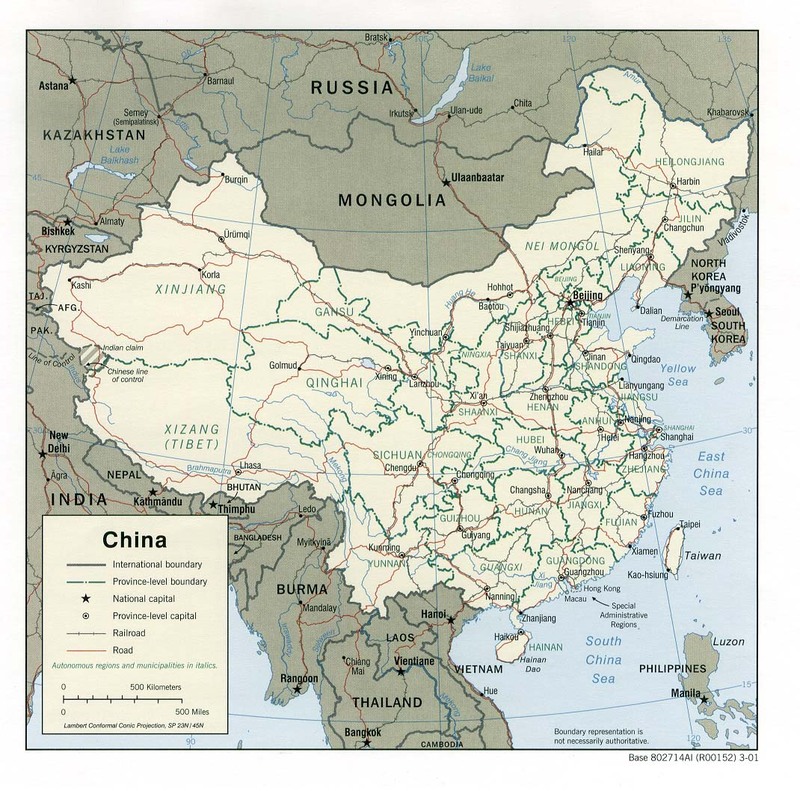 – National Geographic 22″ X 29″ map of China plain or laminated. 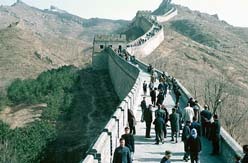 China Travel Golden Route – Travel China with a native Chinese. Learn about Chinese history, culture, artifacts, plan a fascinating itinerary and even learn a few Mandarin phrases. China Travel – China travel agency offers comprehensive China travel information. China is slightly smaller than the U.S. at just under 6,000,000 square miles. It borders 14 other countries and has a coastline of 9000 miles. Its terrain is mostly mountains, high plateaus, deserts in west and plains, deltas, and hills in east. China shares the world’s highest point with Nepal – the 29,036-foot Mount Everest. Its climate is extremely diverse – from tropical in the south to subarctic in the north. Stone tools used by protohumans have been found in northern and central China. Some of the tools date to more than 1,200,000 years ago. Evidence shows modern humans appeared in the Ordos desert region about 20,000 years ago, after the last glacial period. China’s history can be described as having certain repetitive tendencies. The area under political control expands from the Yangtze River basin, the center of Chinese culture, and then, under outside military pressure, shrinks back. Conquerers from the north and the west displace native dynasties and dominate Chinese culture. These uprisings lose their vigor and are driven out by a surge of national unity. Following a disordered and anarchic period a new dynasty may arise. The administrators change, central authority is reestablished, public works constructed and land redistributed. After a prosperous period disintegration reappears, starting the cycle again. The Han Chinese make up approximately 90% of the total population. They speak Mandarin which is the basis of the national language of China. In the south Cantonese, Wu, Hakka, and many other dialects are spoken. Some 108 dialects are spoken in Fujian province alone. The written language is universal. The constitution of the People’s Republic of China allows religious freedom. Traditionally, Confucianism, Buddhism, and Taoism were practiced in an eclectic mixture and these religions have experienced a revival.